The Expanse continues to delight, even in the darkness. 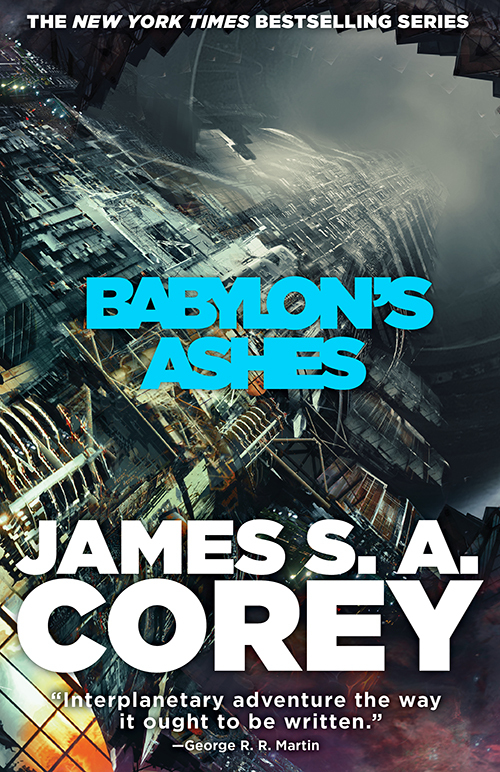 Babylon's Ashes is an interesting entry into the world of The Expanse. As the sixth volume of the series, Corey has moved far away from the early and somewhat awkward introductions of Leviathan Wakes but unlike other books this deep into a series, Corey continues to evolve the world and the characters in new and unexpected directions. James S.A. Corey does a very good job of continually resetting the threats and major conflicts of The Expanse. While the the overarching conflict of the series seems to be that of the Belt versus Earth versus Mars, Nemesis Games raised those stakes by introducing Naomi's former lover and also the son they had together - and then had that same man be the one ultimately responsible for catastrophically dropping multiple meteorites on Earth - think about the one that purportedly killed the dinosaurs and then multiply it by several more rocks deliberately aimed at Earth. Marco Inaros is a swell guy. Babylon's Ashes deals with the fallout of this, of the Belter's managing to steal their own navy and cripple that of Mars, of Naomi losing her son once again to his father, and of the changing political and personal situations resulting from the galaxy altering attacks on Earth. The crew of the Rocinante is back together after individually spending much of Nemesis Games taking care of their own business and as good as that novel was, the interplay of the crew is where The Expanse truly shines. Holden is nominally the protagonist of the series, as much as The Expanse has one, but he only comes alive when he is able to bounce off Naomi, Alex, and Amos. The strength of the series is really how everyone relates around Holden. Babylon's Ashes introduces new viewpoint characters: Michio Pa, a captain of one of the Belter ships; Filip, Naomi and Marco's very angry son; and a couple of much more minor characters who seem to be there more to show the impact of the change in control of Medina station and give a ground level view of how the continued war and conflict impact more lives than just "significant" characters. The only problem is that when we're not with these new characters and not with Rocinante or Bobbie Draper or Avarasala the narrative comes to bit of a crawl while readers try to figure out who they are and why they matter. Not to mention that Filip is just flat out unlikable - though there is a solid sense of tragedy running through Filip's storyline tempered by the knowledge that we know he's Naomi's son and she's fairly well lost him. One of the more interesting aspects of literature is that as much as what the writer puts on the page is so vital and essential, equally important is what the reader brings to the story. Of course the story is what the writer intends, and all of that matters, but we never quite know the intention. The reader can be swept away by the story, but when you read the following, do you think that Corey is only talking about the situation in Babylon's Ashes between Earth, Mars, and the Belt or is he perhaps talking about what is going on today? "We're not people," he said. "We're the stories that people tell each other about us. Belters are crazy terrorists. Earthers are lazy gluttons. Martians are cogs in a great big machine." "Men are fighters," Naomi said, and then, her voice growing bleak. "Women are nurturing and sweet and they stay home with the kids. It's always been like that. We always react to the stories about people, not who they really are." "And look where it got us," Holden said." To me, this is a statement about today, a statement about America today, and perhaps even a statement about the world today. But, is it? Is Corey using this moment to do double work and speak not only to the world of the Expanse but also the present day? "It's true," he said, shaking his head. Or maybe nuzzling a little. "Against all evidence, I keep thinking the assholes are outliers." it doesn't matter if he is only referring to the internal dynamics of The Expanse or if he is also making a point about society. Regardless of intention, the reader's perspective is important and it that perspective which helps build our understanding and appreciation of the novel. As a general rule, Babylon's Ashes is like much of The Expanse thus far: a complete delight to read even as James S.A. Corey continues to write about increasingly desperate and unpleasant actions. As with the ending of Nemesis Games, by the end of Babylon's Ashes we are left wondering where Corey will possibly go after that. Wherever it is, we'll be along for the ride. Penalties: -1 for the new character viewpoints early in the novel. Even as it builds the larger story, most chapters spent away from the Rocinante or Avasarala slow down the narrative. Nerd Coefficient: 8/10 "Well worth your time and attention". See more about our scoring system here.